Mark Collins was given a chance by Dan McCormick at sister track Nottingham in 1980 he had a fair season of 39 meetings with the Outlaws for an average of 5.37. 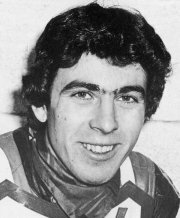 Mark was a Cradley asset along with Glen McDonald and Craig Featherby he was given a place at reserve on 27th March 1980, after three matches he had failed to score a point. He came back into the Heathens team for four away matches at Glasgow, Wolverhampton, Sheffield and a four team tournament at Coventry, with his best score at Glasgow on 6th June when he scored 4 points from 5 rides at reserve. Mark went on to join Stoke in 1981 where he increased his average to over 6.00 from 37 matches with the Potters. He was back at Stoke in 1982 increasing his average to 6.53 before retiring.